Chaise lounge •	Traditionally classic Chesterfield design with an added 'wow' factor showcased by a soft matt velvet fabric that will make for a stylish addition to any living space •	Vintage looking buttoned back. •	Pocket sprung seats offer exceptional levels of comfort. •	Upholstered in eye-catching soft matt velvet durable polyester fabric. •	Fully compliant with UK fire regulations. Silver Chaise Lounge •	Traditionally classic Chesterfield design with an added 'wow' factor showcased by a soft matt velvet fabric that will make for a stylish addition to any living space •	Vintage looking buttoned back. •	Pocket sprung seats offer exceptional levels of comfort. 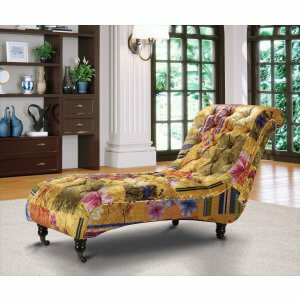 •	Upholstered in eye-catching crushed velvet hardware polyester fabric. •	Fully compliant with UK fire regulations. Aqua Blue Chaise Lounge •	Traditionally classic Chesterfield design with an added 'wow' factor showcased by a soft matt velvet fabric that will make for a stylish addition to any living space •	Vintage looking buttoned back. •	Pocket sprung seats offer exceptional levels of comfort. •	Upholstered in eye-catching crushed velvet hardware polyester fabric. •	Fully compliant with UK fire regulations. 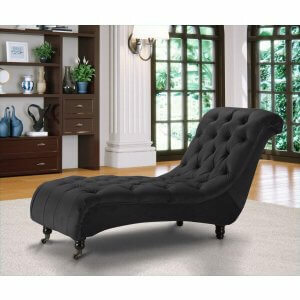 Black Chaise Lounge •	Traditionally classic Chesterfield design with an added 'wow' factor showcased by a soft matt velvet fabric that will make for a stylish addition to any living space •	Vintage looking buttoned back. •	Pocket sprung seats offer exceptional levels of comfort. 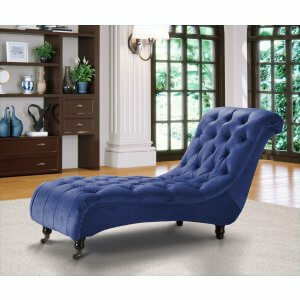 •	Upholstered in eye-catching crushed velvet hardware polyester fabric. •	Fully compliant with UK fire regulations. Denim Blue Chaise Lounge •	Traditionally classic Chesterfield design with an added 'wow' factor showcased by a soft matt velvet fabric that will make for a stylish addition to any living space •	Vintage looking buttoned back. •	Pocket sprung seats offer exceptional levels of comfort. 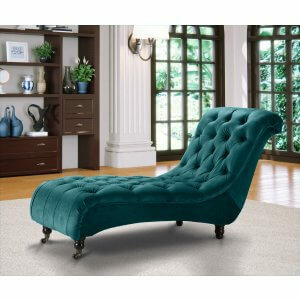 •	Upholstered in eye-catching crushed velvet hardware polyester fabric. •	Fully compliant with UK fire regulations.